Oh I like this recipe - simple, basic, down-to-earth. And, I bet it is just perfectly delicious. I'll have to try it, but first I have to see if I can find any tomatoes worthy of such bliss. I may have to save this until next summer, but I'm going to try some of your other wonderful recipes. I'm back 'cuz I forgot to ask this question: Have you ever thought of doing a cookbook? so sorry (or not?) for your cold mornings... we hit a toasty 90-99 degrees here in southern Cal yesterday! what happened to fall, i ask! :) if i can find good tomatoes (maybe at the farmer's market tonight! ), i'll have to try your recipe! sounds cooling and yummy! thanks susan! When I had it in Andalucia, they served it with a side plate of garnishes which included fried bread cubes, chopped green pepper, and little cubes of serrano ham. One place might also have included chopped hard boiled egg. Did you know that before the tomato was brought from the new world, gazpacho was made with grapes and almonds? Some people still make this and call it white gazpacho. I'm with you--despite an over-abundance of the ingredients, I've never made, nor eaten, gazpacho. My husband is not a fan of soup, which is very sad. And inconvenient. But he does love anything Spanish, after a trip we took there a couple of years ago, so maybe I could sneak this one by him. I am not a cold soup fan but the local grocery here has the sherry wine vinegar. I'd be happy to mail you a bottle if you would like to try it. We had to shut the windows here this week also (northwest Ohio). I am not ready for cold weather!! Thanks for all the adorable photos of your animals. Gazpacho rules! I like to use spicy V8 in "my" version! The first time I served it to Young One, though, he said, "Mom, you forgot to cook the soup!" Thanks for the recipe. I don't think I would change or add a thing! This is what I do. I put 1 English cucumber, 3 scallions, 3 green peppers (sliced into quarters), a large handful of cilantro, and some garlic in the food processor. When it's liquidocious, I put it into a pot or large bowl and pour in 1 large can of tomato juice. Then I season with lemon, lime, or both and some S&P and maybe something a little kickier, like cayenne. Guess what? I just read another blog and she uses The Moosewood Cookbook. I loved the name which is what caught my eye. Now I have to go get one for myself. If you use it too it must be great. Thanks. Gaspacho - I had it Spain in 1968 and it was WHITE! I thought of it as salad soup. No where on the Internet have I been able to find a recipe for White Gaspacho. I would love one because I don't really like tomatoes. I'm definitely a fan of simple, basic, down-to-earth recipes. I think part of that comes from the fact that after you've done all that working growing the food, you don't want to have to mess with it much in the kitchen! Hence my Less Fuss, More Flavor philosophy. Either that or I'm just lazy, LOL. But the truth is that if you start with the best ingredients, you really don't need to do much to them - which suits me perfectly! Yes, the tomatoes you use in this gazpacho should be fabulous. If you can't find any, it'll definitely be worth the wait until next year. It might not be an easy wait, but it'll be worth it. I know I'm planning (hoping?) to get my tomatoes in the ground much earlier next spring so I can have gazpacho in the fridge all summer long. Seeing as how you're still having 90 degree temps there, I have a feeling you should be able to find some nice tomatoes despite it being October. What I want to know is what the heck happened to September? Oooh, the little cubes of serrano ham sound really good. I did learn about white gazpacho during my informal gazpacho research. I bet it's delish, especially with the almonds. I've been on a real almond kick lately. Joe isn't a soup fan either (what is wrong with these guys?) but that's fine because it just means more gazpacho for me. Well how sweet are you? I just might take you up on that sherry wine vinegar offer. I'd be happy to pay you of course. Can you email me about it: farmgirlfare AT gmail DOT com. Thanks! Yeah, I've started shutting the windows the last few nights (we leave them all open all summer long), but I have to open them back up during the day so The Shack will heat up! I'm not ready for winter either. I'm ready for fall and cooler than summer temperatures, but we always seem to go from heatstroke to woodstove in about a week around here! Gazpacho does rule! I can't believe I went my first 40 years without it. I'm definitely planning to make up for lost time. Spicy sounds great! Oh that is so cute! Thanks for the laugh. Mollie Katzen is awesome. I love all the chatty comments that go with her recipes - and she's a wonderful artist, too! I don't use her books nearly enough. One of my favorites is Still Life with Menu which is beautiful as well as delicious. I just checked on Amazon, and you can buy copies for under a dollar (plus shipping) - just click here. I just pulled my copy off the shelf the other day to look for a few recipes I've been meaning to remake and write about. Ooh, good call, Susan - I think I might use my final garden tomatoes to make up one last batch of gazpacho - from your recipe here. Sounds so good! And what IS the story with the hard boiled egg or shrimp in the soup? Although I have not a huge problem with olive oil. 1 1/2 cups might be excessive, but I bet it's yummy! It's usually served either like that or with a small side dish consisting on small fried bread cubes, and chopped onions and peppers (red and green). In summer I usually have it as a drink, at lunch time. Using fridge-vegetables or putting some ice cubes make it great for those hot summer times. You're not the only one who's been doing late season gazpacho. 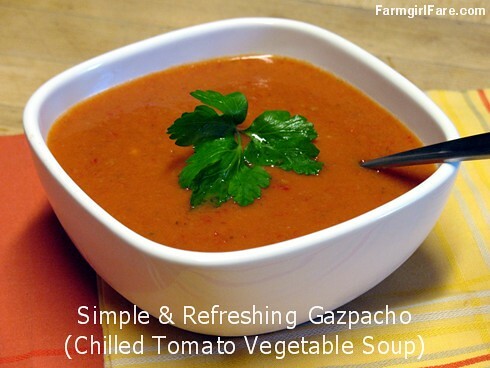 When I first heard of gazpacho it sounded horrid. If not for the rave reviews of it when it was mentioned I'd not have given it a second thought... well, there was one review that made it stand out from a guy who'd a bad experience with a batch he'd been served of just chunky cucumber slush in cold water with salt and cumin. But having become more intrigued by raw foods, enzymes, macrobiotics, I started thinking about gazpacho a bit more. Problem is that now that I've rediscovered the beauty of good tomatoes and heirlooms I'm hard pressed to eat them any other ways than out of hand and sliced on good toast with good salt and lots of basil (I actually like the dried better, crumbled to nearly dust) with sliced onions sometimes. That was my dinner many times this summer almost to the point that I dreaded another but now wish I could have just one more week. Gazpacho was haunting me though. So I decided I had to try it. Except no more cucumbers! They just disappeared this year on short notice. But I did have a zucchini so I googled, found it could work and I had the other ingredients. Toms, red pepper, white onion, really good garlic, celtic sea salt. It was good. So good I wanted to do it again. This time though I got a wild hair when I saw a lonely leek sitting on my counter which I hadn't been able to work into my dining world. I cut a big hunk off and threw it in the blender. Then I pulled out the Italian parsley which tasted so good by itself and so fresh I just kept pulling more off, stuffing it in too. A spare Anaheim pepper? Why not? Unfortunately the only thing I could think to fix it was more tomatoes but seems I'd left the ones I'd picked out special so I could have more of this soup at the store (since the farmers markets are closed now). I remember now setting them down on the apple display to adjust my basket so they wouldn't get squished. After trying to tough it out (all of another two half spoonfuls) I pulled out a can of fire-roasted toms with green chilis and threw that in the blender. It worked! Totally saved it; even made it pretty good. I especially love the bite from the raw garlic. It's amazing how filling even just a little bit is. And really good with a moist corn bread. And it's great to hide kelp powder in (for added iodine). After the new confidence from that save I'm thinking of all the new ways I want to try what I think of as Veggie Smoothies. So it was cool to see that I'd opened this post without realizing it (I still don't remember doing it). Next summer though I know what I'm going to do with some of the lovely lemon and Armenian cucumbers. I plan to have a glass every morning! Thanks for listing out all the ingredients for use you'd found. I won't be using many of them but can use it as a guide for my own experimenting. For now I'm going to do a potato, multi-colored cauliflower, & chickpea stew to use up the rest of that poor leek. I think I could save that too with a can of fire roasted toms if need be. Made this for dinner tonight. Too much garlic for my youngest, so she's having a grilled cheese, but the rest of us LOVED it with crumbled feta cheese on top. YUM! My husband DOES like soup, though he was skeptical of this cold soup concoction. He was surprised how filling it turned out to be. Can't wait to try some of your other recipes! I have never made Gazpacho before, but I have always been interested in trying - I will comment again after Saturday to let you know how it went over. I will be making it for my Pastor's 50th birthday celebration and this will fit in perfectly with the mexican food theme. Thank you! White gazpacho is called Ajoblanco and it is an amaaaazing dish... It is just made with almonds, bread, water, oil, vinegar and salt and it tastes superb with grapes or pieces of honey melon.